Seventy million years ago, a hulking T. rex chomped into a fresh carcass. 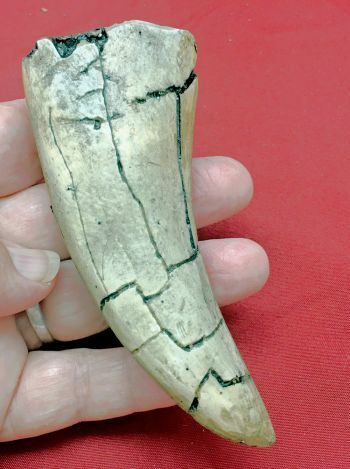 As the giant meat-eater's teeth ripped flesh from bone, this large tooth broke loose and fell to the ground to be fossilized and then cast millions of years later. T. rex commonly lost teeth like this one in a process we call "shedding." These teeth are usually found by scientists apart from a full T. rex skeleton, often near a plant eating dinosaur carcass that served as a feast for the giant Cretaceous predator. Late Cretaceous (70 m.y.a.). North America.